We are pleased to announce a gorgeous litter of 10 Labradoodles born on December 12th. Based on their 55 lb. Labradoodle mom (Elaine-pictured below), and their 58 lb. Standard poodle dad (Sherman), we expect this litter of puppies to be 45 - 65 lbs. fully grown. To see pictures of Sherman, visit our partner site www.bestBernedoodles.com. These fun loving Labradoodle puppies are adorable and incredibly sweet. They are the perfect companions and we believe that they would make a wonderful loving addition to a very fortunate family like yours! Jordyn is our little princess. She is a sweet, happy little girl that loves to be held and cuddled. She is very smart, super loyal, and loving. Josie is a pretty Labradoodle with a super soft white coat. She loves to play outside with her siblings, and she is gentle, loyal, and compassionate. We know that she will be a wonderful companion. Jenna is an absolutely adorable little girl with a wonderful personality. She is loving, playful and great around kids. Jenna loves to snuggle up to us at nights - we will miss her! Juliette is a cute, fun-loving, happy girl. She has been a joy to raise and we are confident that her warm personality will make her a great new friend for one very fortunate family! Jensen is a cute little Labradoodle with a silky black coat. She is so much fun to be with, and she will be great with kids. Jensen is also gentle and very smart and we believe will be a great new addition to any family! 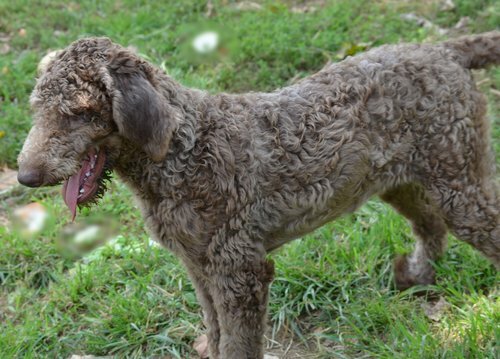 Jamie is an adorable female Labradoodle with a joyful personality. She loves to be with people, and she is extremely smart. We loved raising her but are also very excited for her to meet her new family! Justine is a gorgeous girl with a wavy black coat with a thin marking of white on her chest. She will certainly receive a ton of compliments! Justine is loyal, friendly, and loving! Jax is a sweet little guy that has a huge heart for people. He loves company and he especially loves being held and petted. We know that he will make a wonderful companion. Jonah is a handsome little guy that loves to play. He is fun-loving and can regularly be found romping around with his siblings. Jonah is super loving and very loyal, and we think that he will be wonderful for an any family or individual. Jersey is a very handsome labradoodle with a deep black coat as soft as silk. He has the kind of face you just can't say no to. He is so much fun to be around and always finds a way to make us smile! Jersey is super smart and very loving, and we know that he will be a wonderful furry family member.